What makes GaryVee so popular? Why does he have the following that he does? I think it’s because Gary doesn’t spend much time telling people what to do. He wants to help people change the way they think. He doesn't spoon feed people answers. He shows people how to get the answers. When we teach people how to think, we don’t have to give them an answer, and when we learn how to think, we don’t have to know the answers to every question. When you learn to learn, you are setting yourself up to be successful in the game of life later on. When you learn algebra, you aren’t so much learning how to solve equations, as you are learning how to solve problems. 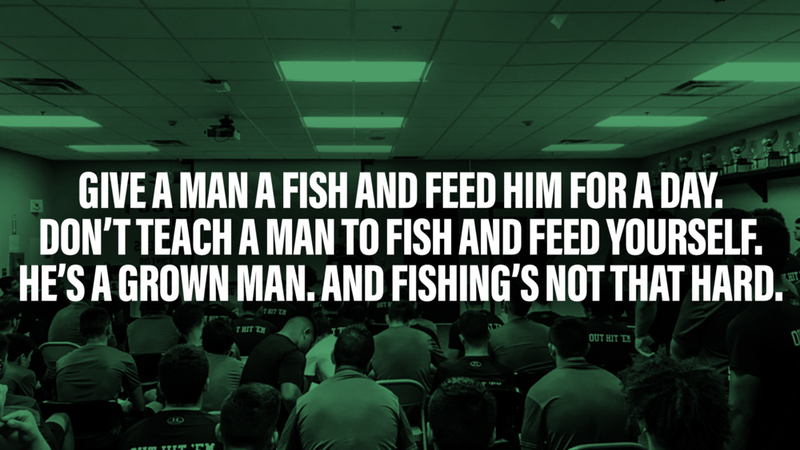 When you learn how to treat people in the locker room, you develop skills that you can use later on in life. There will come a time in our lives when the questions we get will be bigger than the answers we have been given. I want to be prepared for that when it happens, and I want you to be prepared too. Father Richard Rohr talks about this process of moving from construction to deconstruction to reconstruction. As you move through your life and your faith, you encounter things that challenge your fundamental beliefs. So you can either ignore those questions, or you can wrestle with them and learn how to hold them in tension. You can begin to learn that it’s okay to ask questions. That it’s okay to have doubts. That deconstructing your faith is okay because it can lead to a reconstruction of an even more robust faith. When you find yourself relying on answers, stop and ask yourself one more question: What would happen if you were to simply begin to ask questions? You’ll be amazed at what you begin to learn. What questions are you afraid to ask about life, faith, or anything else? What is it that you hold so deep that if it were taken from you, you would fall apart? Why is it scary for you to ask questions? What are you afraid will happen? What questions do you need to ask this week? How can you begin to deconstruct so that you can reconstruct? Older PostBring On The Pain!